Save on production time spent manually filling transferring two part epoxies and silicones from tins and cans to empty cartridges. Reduce waste and mess. Air-free filled dual cartridges improve output. Reduce harmful fumes from using open pots and cans on the workbench. Dual component cartridges are available empty or pre-filled with your own specified materials. 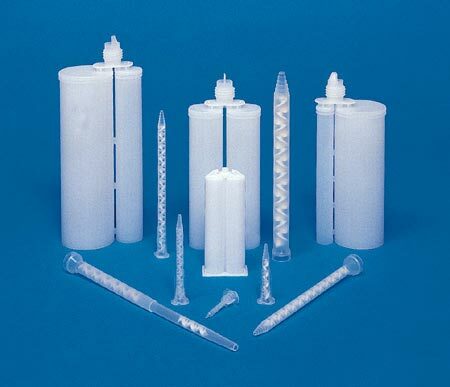 Typical materials supplied in pre-filled dual cartridges include epoxies, silicones, resins, compounds and adhesives. All cartridges are supplied with reduced air entrapment and include pre-inserted wiper pistons and cap seals. Each filled cartridge is packaged into a sealed pack and can include product label with safety details, fill date, shelf life and volume. We only supply the highest quality plastic components that are silicone free and industrial grade safe. 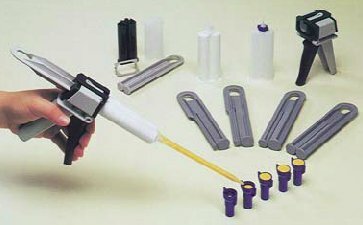 Twin cartridges are ideal for fixed ratio materials and work with a wide range of manual and pneumatic dispensing guns. Both materials are kept separate, there is no danger of cross contamination. A wide range of fluid viscosities can be packaged eliminating the need for weighing and mixing by hand. Exposure to raw materials is eliminated and so reducing skin complaints and harmful fumes. By using a twin cartridge, material waste is reduced which make packaged cartridges a cost effective solution to any two component fixed ratio adhesive application. Prices are in Sterling GBP and exclude VAT which is charged on UK orders at checkout. Orders are encrypted on a 128 bit secure server for total security. All personal information and payment details is encrypted on SSL secure website pages. Statements, technical information and recommendations contained herein are based on tests we believe to be reliable but they are not to be construed in any manner as warrantees expressed or implied. The user shall determine the suitability of the product for his intended use and the user assumes all risk and liability whatsoever in connection therewith. Copyright 2017 Adhesive Dispensing Ltd. All rights reserved.